On February 2, 2019, U.S. House Representative Tulsi Gabbard (38) officially launched her 2020 presidential campaign. 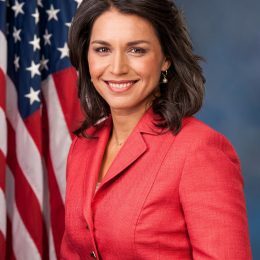 Gabbard is an Iraq war veteran who became the first Samoan American and Hindu in the United States Congress when elected in 2012. Kamala Harris (left) and Tulsi Gabbard. Photo credits: https://www.tulsi2020.com and https://kamalaharris.org/. Harris trails Gabbard and NJ Sen.